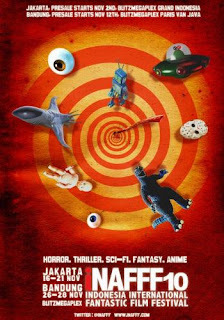 Thai action and horror will take part in the Indonesia International Fantastic Film Festival from November 16 to 21 at the Blitz Megaplex Jakarta and November 26 to 28 at the Blitz Megaplex Paris Van Java in Bandung. The fourth annual edition of Southeast Asia's only genre fest offers lots of clanging-sword action in Bang Rajan 2 (บางระจัน ๒), Thanit Jitnukul's CGI-blood-spattered sequel to his 2000 historical action epic about plucky Siamese villagers standing up to the Burmese invaders. 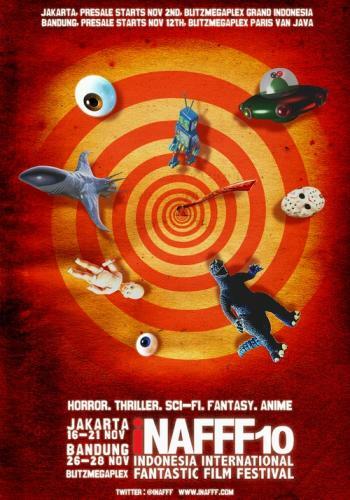 There's also a solid dose of horror, with The Snow White (ตายทั้งกลม , Tai Tang Klom), Sarawut Intaraprom's pretty good and pulpy ghost thriller about a pair of students who steal a fetus out of a dead mother's womb. And there's the just-released Fan Mai (แฟนใหม่, also known as My Ex 2), director Piyapan Choopetch's followup to last year's ghostly girlfriend revenge thriller (Fan Kao, แฟนเก่า). "Koy" Ratchawin Wongviriya stars, playing a young woman who breaks up with her boyfriend after seeing him with another girl, who turns out to be dead. Pete Thongchua is lurking around in Fan Mai, casting menacing glances. INAFF opens on November 16 with Gareth Edwards' sci-fi biological horror Monsters.